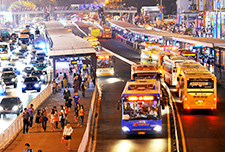 Of all the capacity-building activities that could be undertaken for people involved in BRT planning, probably the single most useful and influential is to visit the most successful BRT systems in Asia, and hear directly from the key planners and designers of the systems. 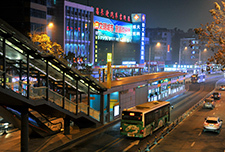 Far East Mobility's site visit program provides this opportunity. 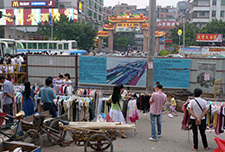 Most popular are the half day and one day site visit programs. 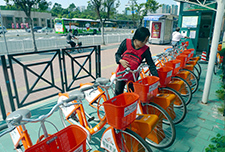 Far East Mobility hosts site visit and technical briefing programs for key demonstration projects in urban transport and urban development. 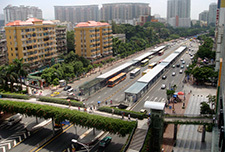 The Guangzhou BRT is introduced here. 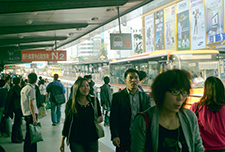 Peak passenger flows of around 25,000 pphpd. 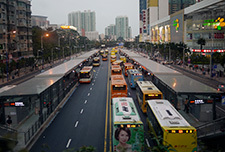 This is far in excess of capacity limits formerly thought to apply to 'direct-service' BRT systems in which vehicles operate both inside and outside the BRT infrastructure, avoiding passenger transfers, and is more than double the throughput of the next highest system in Asia (Xiamen, with 9,850 pphpd). 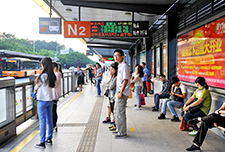 Daily ridership of more than 800,000 passenger-trips. 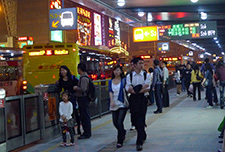 Passenger boardings of 8,000 passengers per hour (not including transfers) at the biggest morning peak and evening peak stations. 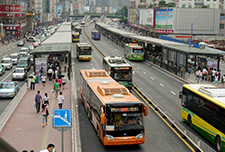 Some of the world's longest BRT stations and the highest BRT bus volumes: 240-300 per hour in a single direction, or roughly 1 bus every 12-15 seconds in a single direction. 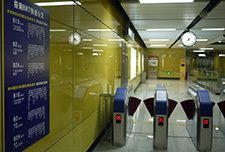 Direct connecting tunnels between metro and BRT stations. 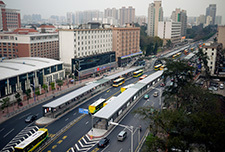 Inter-modal connections (BRT, metro, bike sharing, bike parking, pedestrians, adjacent buildings) make the Guangzhou BRT corridor a leading example of multi-modal transport integration. 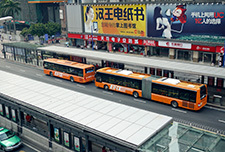 The only BRT system in China with more than one BRT operator: three corporate groups consisting of seven different bus operating companies all operate BRT routes. 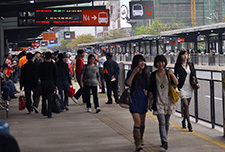 The first BRT system in Asia to determine station size based on passenger demand, for all stations. 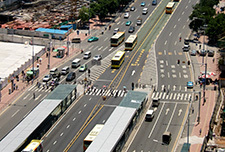 This results in a range of station lengths from 55m to more than 250m. 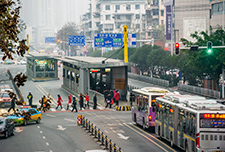 30% higher bus speeds, resulting in an average time saving of 6.63 minutes per BRT trip, or 88,000 passenger-hours per day, or more than 30 million passenger-hours saved each year. 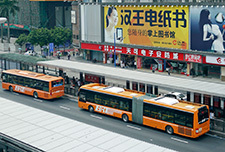 A halving of out-of-pocket bus trip costs for passengers, from 4.9 yuan (December 2009) to 2.6 yuan (August 2010). 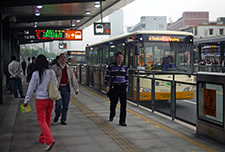 Operational losses (revenue minus costs) per bus-km fell from 0.9 yuan (before BRT) to 0.3 yuan. 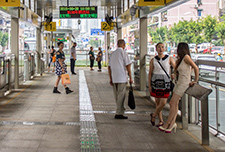 A 15% decrease in bus waiting times along the BRT corridor, compared to a 7% increase in another (non-BRT) corridor, done as a control survey. 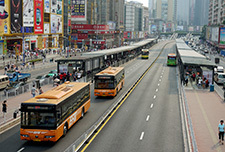 In the BRT corridor, an increase in those satisfied with public transport from 29% (Dec. 2009, before the BRT) to 65% (Dec. 2010), and a decrease in those dissatisfied with public transport from 21% (Dec. 2009) to 2% (Dec. 2010) (see this article on passenger satisfaction, and this article on reliability). 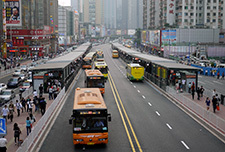 A large increase in civic pride, with those agreeing 'I am proud of Guangzhou' increasing amongst bus passengers in the BRT corridor from 40% (before the BRT) to 73%. 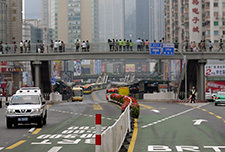 Amongst car drivers the figure was unchanged, and in the control survey in a different corridor, civic pride amongst bus passengers decreased slightly over the same period. 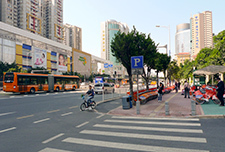 An increase in bus passengers agreeing that 'the environment in Zhongshan Avenue [the BRT corridor] is good', from 17% (before BRT) to 67% (after BRT). Those who disagreed fell from 52% to 9%. 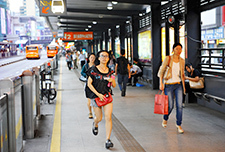 An increase in those agreeing that 'I feel safe walking along Zhongshan Avenue' from 28% before the BRT to 68% after BRT (see article). 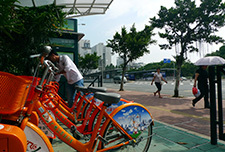 An increase in cyclists along the BRT corridor by 50% in the highest demand locations, within the first year (see article). 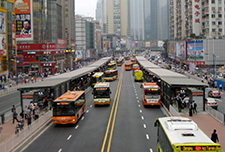 Significantly lesser greenhouse gas and local emissions, with faster and smoother traffic, and fewer and newer buses. 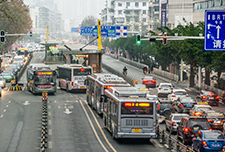 More than 50,000 tons of CO2 emissions were reduced in the first year of operation due to fewer bus-kilometers, faster and smoother traffic, and mode shift from cars and taxis to buses. 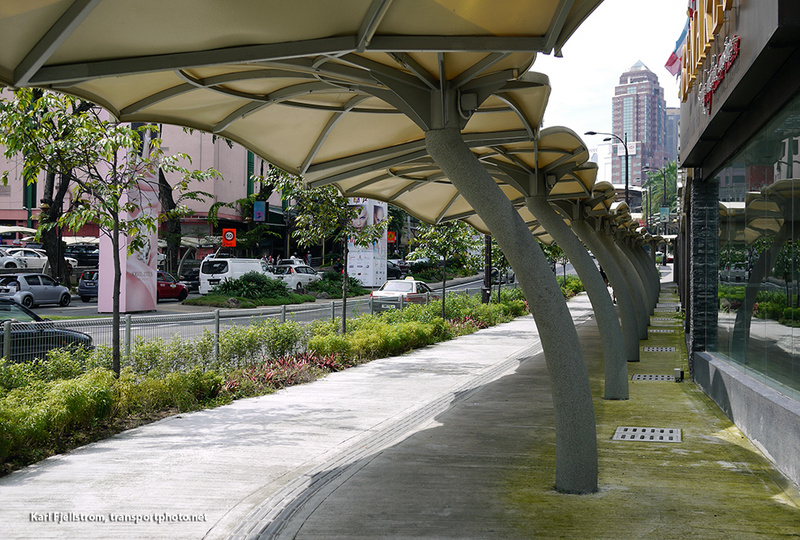 The first BRT corridor will average 84,000 tons of CO2 emission reductions per year over the first 10 years of the project. 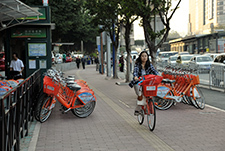 The Guangzhou BRT and integrated bike sharing system won the 2011 Sustainable Transport Award in a ceremony in Washington DC on 24 January 2011. 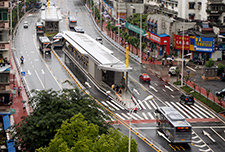 The BRT system has also been awarded city and provincial first level design prizes, and was acknowledged as a UNFCCC 'Lighthouse Award' recipient in 2013. 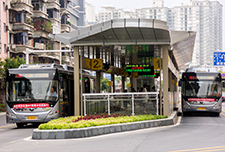 Also in 2013 the Guangzhou BRT was the first BRT system in Asia to receive a 'Gold Standard' rating in the BRT Standard scoring system. 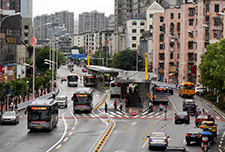 The Guangzhou Modern BRT and Sustainable Transport Institute, led by Far East Mobility experts working for ITDP, in 2012 won an international bid by the Asian Development Bank to provide the BRT preliminary design in Yichang, the second largest city in Hubei Province after Wuhan, and the site of the Three Gorges Dam. 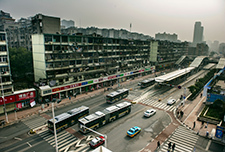 This major project features a BRT corridor through the city, and Far East Mobility experts (working at the time for GMEDRI and ITDP-China) led the preliminary corridor design, demand analysis, operations, station and road design, modal integration plan (focusing on pedestrians & bicycles), and other system features. 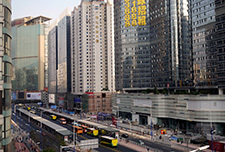 The construction of the Yichang BRT started in February 2014. 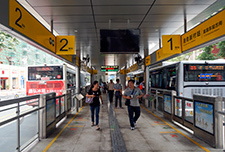 The system opened on 15 July 2015. 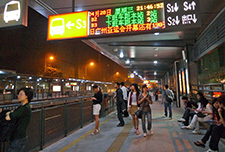 The full phase 1 and 2 corridors run 23.9 kilometers with 37 stations connecting major urban sub-centres in the north and south of the city. 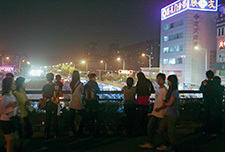 A preliminary impact analysis is available here. 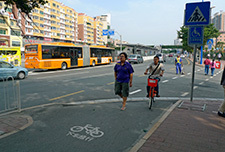 Yichang Vice Mayor with one of Far East Mobility's site visit guides, Chief Engineer of the Guangzhou BRT Xiaomei Duan.